December 5, 2014 February 10, 2016 ~ Sara W.
Can you believe it? This marks my 100th post on this blog! Pretty exciting stuff! Let’s celebrate by doing a modest giveaway, as I’m a modest girl. More details about the giveaway later in this post. For those that are new to the site, I thought I would share a little about what a “First Friday Find” is here on First You Must Begin. In short, it’s anything I find that is worth sharing. The criteria I give myself when deciding what I share on the first Friday of each month is simply: What is something I have discovered recently that is worth sharing in an effort to make other’s lives better or easier? In the past year, First Friday Finds have ranged from an App I’m passionate about (Chatbooks), to a YouTube series that makes me laugh (True Facts), to a craft that was easy enough for me to pull off (Lost Socks), to a book that has helped me as a parent (The Care and Keeping of You) to a silly toy (Splat!) and beyond! The best part is knowing that no person or company is paying me to say these things, so you can be at peace knowing that I only share from the heart. That being said, this month’s First Friday Find is a life hack that I discovered while on vacation. We recently visited family and friends down in Southern California. A dear friend of ours was willing to host the shenanigans of a family of six and even convinced us that she was sad to see us go when it was time for us to leave. Either she is an excellent actress or she really likes us. I’m opting for the latter. I digress. 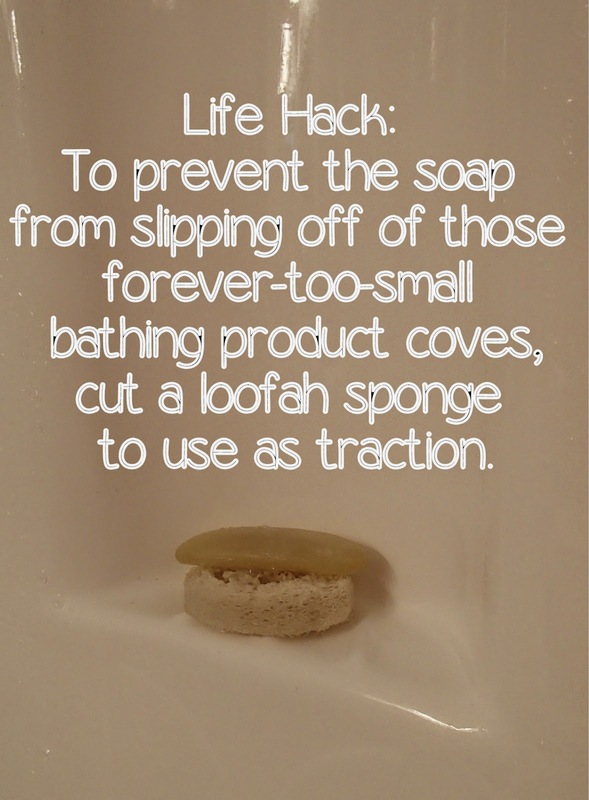 When I was using her shower, I noticed that she had sliced a standard loofah sponge to use as a way of keeping the soap from sliding off of those forever-too-small-and-slippery coves for bathing products to sit on. It seemed so simple and yet so ingenious to me. Even better than not having to keep the soap from falling, was realizing that I could utilize the soap remnants that accumulated on the loofah sponge. At the end of the shower, I took the loofah sponge and gave my feet a good scrub. Huzzah! A dual purpose life hack! This life hack brought to my mind two additional life hacks that my husband has taught me from his experience working in the Emergency Department. Thinking about giving your child a Popsicle and all you can envision is the sticky mess that will inevitably be all over their hands and the floor? 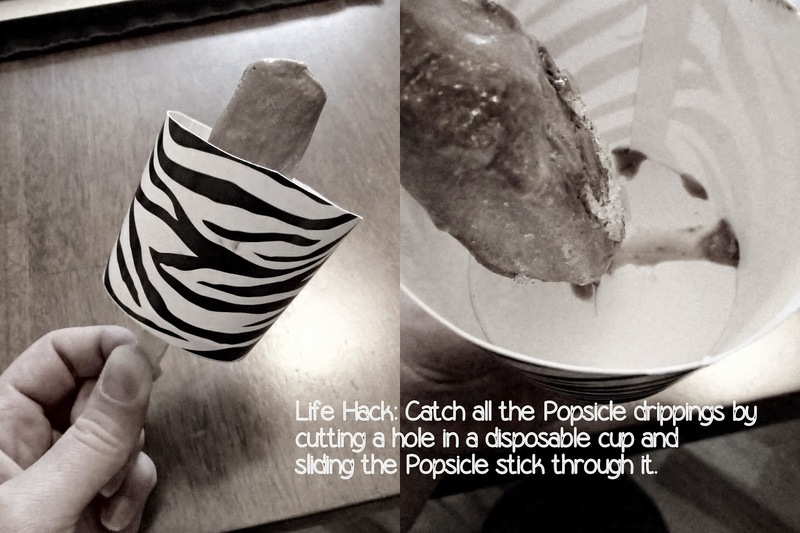 Try grabbing a paper or Styrofoam cup and slicing a hole in the bottom of it, then slide the Popsicle stick through the hole. The base of the cup catches the drippings and makes for a quicker clean up process. Styrofoam cups are best since they can be peeled away as the Popsicle gets smaller. I had to pre-cut the paper cup shown, which slows down the process a bit. The last life hack to share will be best appreciated by parents everywhere! Getting an infant or toddler to successfully take a full dose of liquid medicine, when needed, is near impossible. Before this trick, I would often be cleaning all the medicine from my baby’s face and neck versus knowing it was safely in his or her system. Then I witnessed my husband’s technique to get medicine to go down versus coming out. First, place the medicine dropper in the back corner of either side of their mouth. I think most parents are aware of this step. Next, dispense the medicine. I suggest doing it in smaller portions of the complete dose. Lastly, here comes the trick, give a quick blow in the the child’s face. The surprise of the blow causes a reflex reaction for the child to immediately swallow. TA DA! Amazing, right? I’ll be sure to pass along your gratitude to my husband. Now that I’ve wowed you with these three life hacks, let’s talk about celebrating the fact that this is my 100th post. Hang on to them hats and glasses, it’s gonna be a stellar giveaway (said in sarcastic voice)! 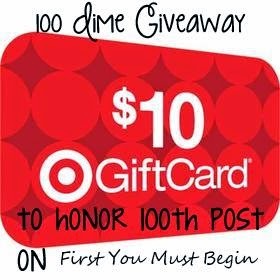 100 dimes just for you to honor my 100 posts! That’s right! Ten whole dollars! Let’s make it a little more personal and make it $10 to Target. I told you I was modest. Truthfully, that’s about all I can afford to giveaway this time of year. I’m a stay-at-home mom with four kids, people! However, I really am quite excited about reaching 100 posts and it’s been so much fun to develop this website, that I want to share the love! I hope you’ll want to share the love too by entering the Rafflecopter giveaway below. I love your posts, give away or not!